Arsenal defender Thomas Vermaelen set for summer exit? Thomas Vermaelen fears his World Cup dream will be left in tatters if he stays at Arsenal next season. The Gunners skipper spent the final two months of the season sat on the bench as Laurent Koscielny and Per Mertesacker firmly established themselves as Arsene Wenger's preferred central defensive partnership. 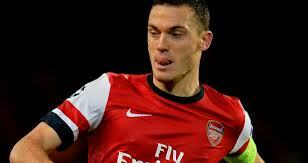 Vermaelen is settled at Arsenal and ideally wants to stay and fight for his place next season. But the 27-year-old is concerned he could be forced out of the club if Wenger signs a new central-defender during the summer transfer window. Wenger has a concrete interest in Swansea defender Ashley Williams, who would jump at the chance to join the Gunners this summer. The Gunners made an initial enquiry for the Wales international in January and expected to renew their interest in the coming weeks. Arsenal chiefs will consider offloading Vermaelen this summer if the right offer comes along, though his departure would still come as a surprise.